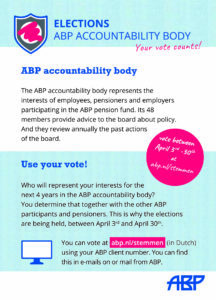 The ‘Verantwoordingsorgaan’ is an accountability body for the ABP pension fund. This body represents the interest of all employees, pensioners and employers. The employees and pensioners elect every four years representatives to take seat in this body. The consists in total of 48 members and provide policy advice to the board of directors of ABP. Also, they review annually the past actions of the board. What does LvOP stand for? The LvOP is the only independent group of employee representatives within the accountability body. 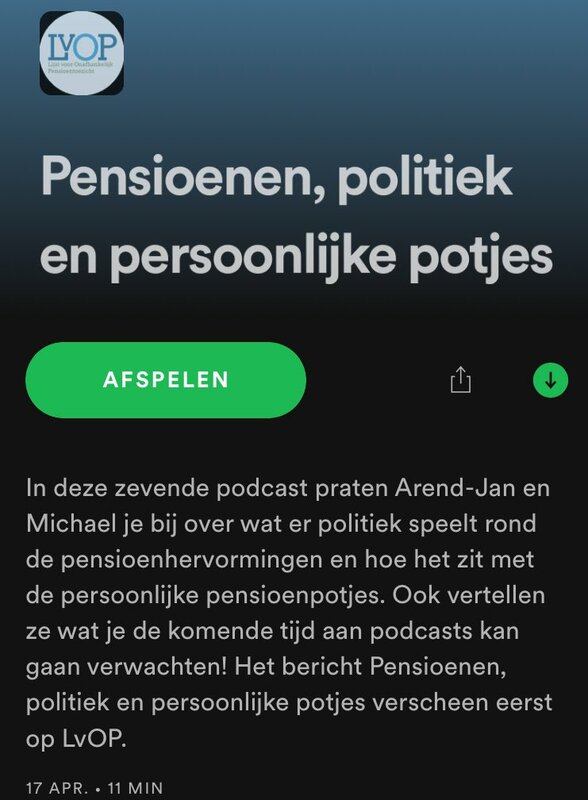 The acronym stands for Lijst voor Onafhankelijk Pensioen Toezicht, which translates into List for Independent Pension Supervision. The LvOP has a fres perspective on pensions and aims to represent those who are not represented by unions. The last 4 years we have proven to be independent, critical and in full knowledge. 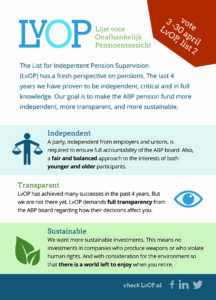 Our goal is to make the ABP pension fund more independent, more transparent and more sustainable. Voting for a candidate of the accountability body (“verantwoordingsorgaan”) is very easy. As an active participant you can vote for one of the candidates on the list (for active participants). You are an active participant if you are currently working at an organisation that is related to ABP pension fund and part of your monthly salary is paid to ABP. You can vote between Tuesday April 3rd and Monday April 30th. The elections will close on April 30th at 23:59. You can vote online, or by phone. Login using your client number (“klantnummer”). You will find this on the list of candidates (other side, upper left) which has been sent to you. It is also included on all other correspondence from the ABP pension fund.